Gythion Greece. Authentic Greek Town in the Mani, Peloponnese. Probably the best thing about Gythion is that it’s a pretty, typical Greek town where you can experience real Greek life because it’s not yet been invaded by foreign tourists. Hidden in southern Greece, in the mysterious region of the Mani in the Peloponnese, it’s easily overlooked as a tourist destination. The pastel colored neo-classical buildings and the long promenade with many tavernas, bars, and shops at the sea front, are the first things that will catch your eye when you arrive in the Greek town of Gythion at the Mani Peninsula in Greece. This is the official capital of the Mani, with a history that goes back thousands of years. 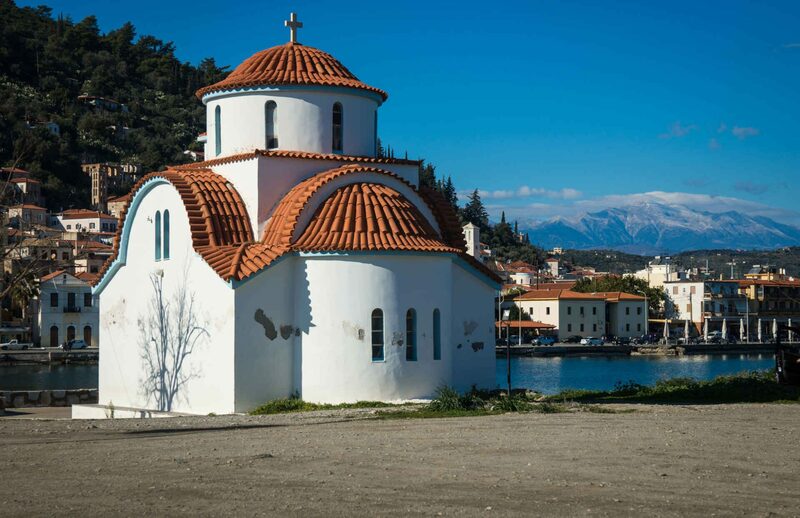 The charming Greek town of Gythion, in the back the snow-capped peaks of Mt Taygetos. 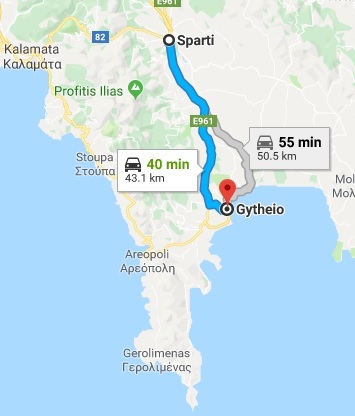 In Gythion (also Gythio, or Gytheio), Phoenicians from Libanon traded Tyrian purple dye they extracted from sea snails they caught here in the sea, while later, the port of Gythio became the most important port of Sparta. Except for tasting the local cuisine, having coffee or retsina in the harbor while gazing at the Taygetos Mountain, and strolling through the small alleys of the hills of Gythio, there are many things to see in the area around Gythion: the ruins of historic castles, villages with impressive Mani tower houses, lonely towers on top of rocks, Byzantine churches, monasteries, old pirate coves, exotic beaches, and very fascinating landscapes. Gythion is located at the east side of the Mani Peninsula in the Peloponnesos in southern Greece. It belongs to the Greek region of Laconia. Gythion is built at the southeastern foothills of the Taygetos Mountain, about 45 km south of Sparta. In Gythion, the Taygetos almost reaches the waters of the Laconian Bay. Note that if you plan to visit Gythion independently, you will need a car to move around in the area. Route Sparti (or Sparta) to Gythion in the Mani in Greece. ⇒ Travel idea Peloponnese ⇒ Hiking one of the best hiking trails in Europe ⇒ The Menalon Trail in Arcadia. Because of Gythion’s location, it is a perfect base for exploring the Deep Mani. The Deep Mani is what is often called the “real” Mani, and it starts below the beaches of Gythio at the eastern side of the Mani Peninsula, and at Areopoli at the western side of the Mani Peninsula. In the Deep Mani the roads get narrower, and the landscape becomes very rocky and rough, with hardly any greenery or even soil. Most tourists don’t visit the Deep Mani, even though it’s an area with a lot of history, fascinating architecture, and breathtaking landscapes. As you get into the Deep Mani, the landscape gets very rough. If you take a look at the map of Greece, you can see that Gythion port is the nearest access of Sparta to the sea. 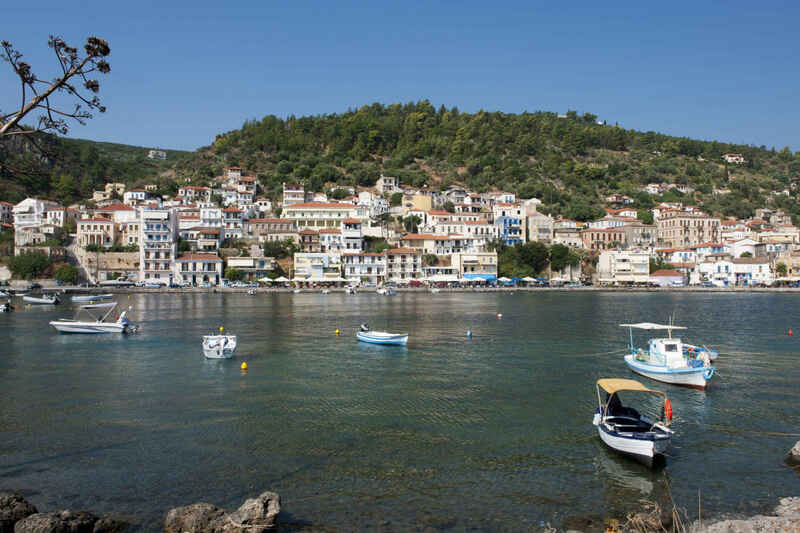 Hence, in ancient Greece, the port of Gythion was Sparta’s most important harbor. This glory has long gone, and nowadays mostly fishing boats, ferry boats, and some cruise ships use the harbor. There are regular ferries from Gythio to the Greek islands of Kythira and Antikythira. In the Mani, you would expect every town and village to have characteristic Mani tower houses. The Mani was known for its rough living conditions, pirates, bandits, and vendettas. Living in high fortified tower houses was a way for the Maniots to protect themselves. Gythion has a completely different architecture, though. Gythion only has one building that looks like a Mani tower, moreover, it has an entirely different look than other places in the Mani. In Gythion, enchanting neo-classical Greek buildings and houses in pastel colors dominate the long promenade along the sea, creating an “island feel”, despite being on mainland Greece. If you want to see Mani tower houses, you don’t have to travel far though. They can be found everywhere around Gythio. He enjoys his stay, though. He climbs up the hill and enjoys stunning views over Gythion, the Taygetos Mountain, and the Laconian Bay, he drinks coffee at the cafe on the waterfront, he has a hair-cut at a local barber shop, he eats local food and drinks retsina at a small taverna, and has lots of talks with local Greeks. Nowadays, the people of Gythion live off the production of citrus fruits, olives, agricultural products, fishing, and tourism, but long ago Gythion’s harbor was used by the Phoenicians for the trade in purple dye. This continued in Byzantine and Roman times. Gythion was famous for the export of porphyry and Tyrian dye, both known for its royal purple color. Video – Tyrian purple dye was made from snails. Porphyry is a type of rock valued for its purple-red color. It was extensively used as a building material by emperors and royals in the Byzantine and Roman Empires. It was heavily exported to Constantinople and Rome. Just like the other famous export product, the Tyrian dye. The purple dye was extracted from a type of predatory sea snail (the murex snail) that lived (and probably still lives) in abundance in the Laconian Gulf and was used for dyeing royal garments. Near the shore of Gythion is the tiny island of Cranae located. It is assumed that at Cranae they had the facilities for the extraction of the Tyrian purple dye from the murex snail. The island is also often called Marathonisi, after the herb fennel, that’s very aromatic and once grew in great abundance on Cranae. The Greek word for fennel is “marathos”, and that’s how the island is also called “fennel-island”. The little off-shore green island, covered with pine trees is nowadays connected with the shore by a causeway, so you can walk to it. The little island of Cranae is already mentioned by Homer in the late 8th century BC. 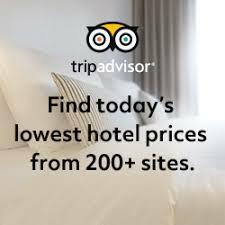 According to Homer, who wrote two central works of ancient Greek literature, the Iliad and the Odyssey, is Cranae the place where prince Paris of Troy and the beautiful Helen, wife of King Menelaus of Sparta, spent the night together before they left for Troy. As you might know, Paris taking Helen to Troy was the reason the Trojan War started. The name Cranae is said to originate from the Greek word “kranos”, which means “helmet”. The legends say that Paris forgot his helmet on the island, and that’s why they named it Cranae. The only Maniot tower of Gythion, the Tzanetakis Tower, is located on Cranae. It was built in 1829 and houses a museum, that unfortunately never seems to be open. Seascape with lighthouse on little island of Cranae at Gythio. Another landmark of Gythion housed on the island of Cranae, is a Greek lighthouse, built in 1873. It’s constructed entirely from marble and has a height of 23 meters. At the entrance of the island, you will find the little white chapel of Agios Petros. This is a favorite destination for weddings because of the great views and the picturesque chapel. Little church on the island of Cranae in Gythio, Mani Peloponnese. In the back the Taygetos mountain. Despite its history of thousands of years, few monuments of the ancient city of Gythion have survived. This is probably due to a horrific earthquake that took place in 375 AD, which caused most of the ancient Greek city to disappear in the sea. A monument of the Roman empire has survived at the foot of the acropolis of ancient Gythion. Here you can find the remains of a Roman theater which is, considering its age, well preserved. ⇒ Other places in the Peloponnese to visit: read more and see pictures of the stunning monastery of Philosophos, hanging off a cliff in the Lousios Gorge in Arcadia. During the Turkish occupation a secret school was housed here. Gythio is surrounded by great beaches, some of them have a length of many kilometers. The nearest beaches are Mavrovouni Beach and Selenitsa Beach. A little farther away you will find even more beaches, like Evrotas beach, and Vathi beach. Mavrovouni beach is a large sandy beach, with warm, crystal clear waters, only 1.5 km from Gythion, and right below the historic village of Mavrovouni. It’s a very long beach (about six kilometers! ), so you will find anything you want, from quiet, lonely places until crowded beach bars and tavernas. It’s a very popular beach, and there are many hotels and campings around. Because the winds in the Laconian Bay can be very strong, especially in the afternoon, it’s a perfect and very popular beach for windsurfing. Video – Mavrovouni beach, near Gythion on the Mani Peninsula in Greece. 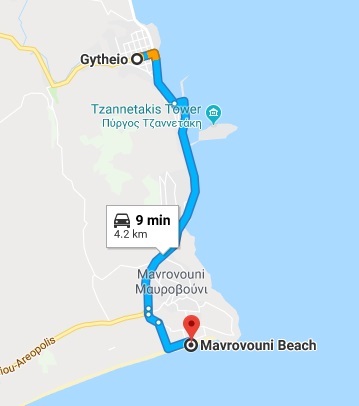 From Gythio to Mavrovouni beach. The village of Mavrovouni is located above Mavrovouni beach. Nowadays, it’s a picturesque little village with traditional houses and narrow streets, spread over the hills. At the central square of Mavrovouni, you can eat or drink something with a view on the impressive Maniot towers. Mavrovouni was famous in the Mani for being the seat of the bey. During the rule of the Ottoman Empire, the Turks appointed beys (chieftains) to regions of the empire that were ruled by some form of self government. The Peloponnese region of the Mani was also ruled by a bey. Bey Zanet (1742 – 1813), was a member of the famous Maniot family Grigorakis, who was forced by the Turks to become bey of the Mani in 1782. Zanet or Zanetbey, built the village of Mavrovouni to become his seat. He also built the Goulades castle on top of the hill. Actually it’s not a castle, but more like a tower house. The rusty shipwreck Dimitrios at Selenitsa Beach. Selenitsa beach is not only a beautiful sandy beach, it also houses the shipwreck of Dimitrios at the place called Valtaki. The rusty shipwreck north of Selenitsa beach, is a great attraction. In 1980, the shipwreck of Dimitrios was abandoned by its owners because their company had financial problems, and the ship had some mechanical problems. Selenitsa beach was not the original location where the ship was left, but it drifted to this place in bad weather. It’s a pretty weird sight, and some people even swim around the shipwreck. Not sure if this is a good idea, though! 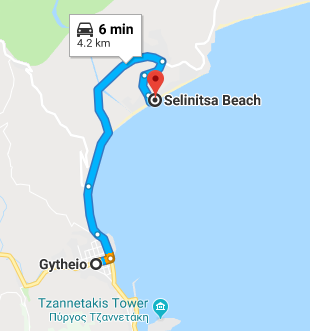 The route from Gythion to Selenitsa beach. The Dimitrios shipwreck is a little farther to the north at a place called Valtaki. More crystal clear waters can be found at Vathi beach, which is about 6 km outside of Gythion. Its pebbled beaches are popular with families, and some of the best hotels of the area are situated here. From Gythio to Vathi beach. You don’t have to travel to the Island of Zakynthos to spot Caretta Caretta sea turtles. The beaches around Gythion are of great interest because of the Caretta caretta sea turtles that lives here. If you are lucky you will spot one, but for sure you will see the nests with the turle eggs. Beware that these are protected animals and so are their nests. Watch this video on YouTube: Caretta Caretta baby turtles in Greece can be found on Mavrovouni beach near Gythion. Gythion has plenty of touristic facilities, but unfortunately, tourism has decreased dramatically in the last years. About ninety percent of the people that came to Gythion to spend their holidays were Greek. With the Greek economic crisis hitting all of Greece, fewer Greeks come to Gythion to spend their vacation. Of course, this affects the people of Gythion economically. Gythion remains a very attractive holiday resort, even though some of its facilities may seem a little outdated. If you care for its architecture, its “island feel”, its charming tavernas, cafes and shops in the beautiful neo-classical buildings, the small alleys leading through the neighborhoods of Gythion on the hill, and its large sandy beaches, you can definitely have a good time here. Gythion is to be considered as an off the beaten path destination in Greece and a good base to explore the Mani Peninsula. A relatively quiet place where you can drink your coffee in peace at the sea front, while next to you the octopus tentacles are hanging to dry in the sun. Where you can have your lunch while looking at the snow-capped peaks of Taygetos Mountain, and have a walk through the old neighborhoods of Gythion in the hills. The picturesque and old village of Geraki in Laconia, Greece. On top of a hill is the Geraki castle situated. Gythion Greece. Things to do. Walk the endless sea-side promenade to enjoy the pastel-colored neo-classical Greek buildings. 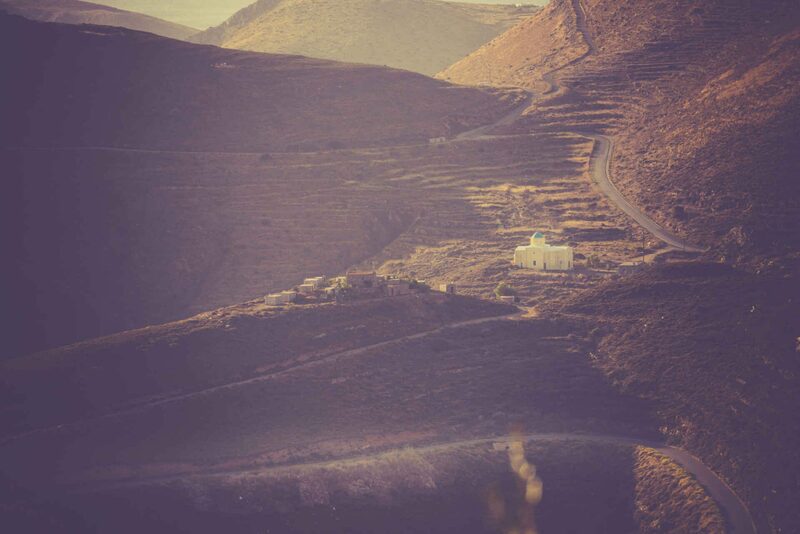 Walk the small alleys that lead along old stone houses, blooming courtyards, and chapels on the Koumaros hill, on which Gythion is built. . Climb to the top of the Koumaros hill. Where the last house ends, a path leads to the little Agion Panton church. Breathtaking views will reward you. 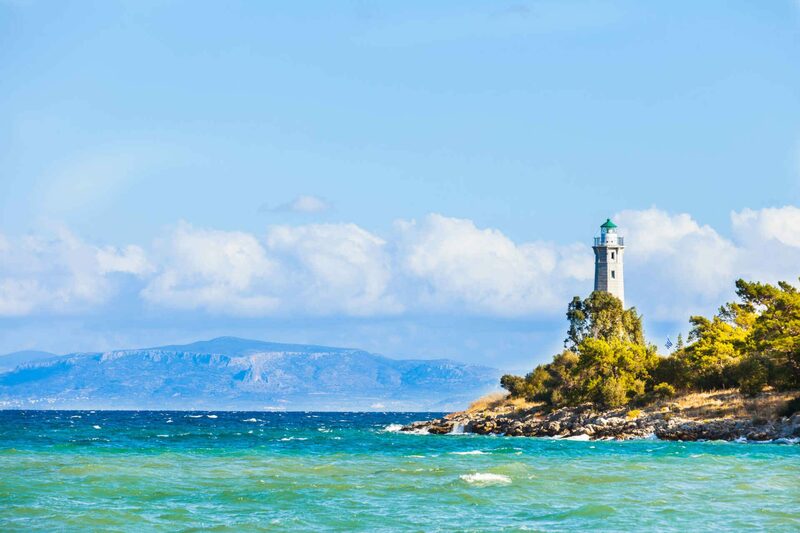 Visit the Maniot tower, the marble light house, and the picturesque chapel on Cranae island. Visit nearby villages in the Taygetos Mountain. Visit the Ageranos settlement in the Vathi bay, to see great architecture of the Mani, like the tower house of Tsokanis, the Grigorakis Tower, and the Agios Nikolaos Church. 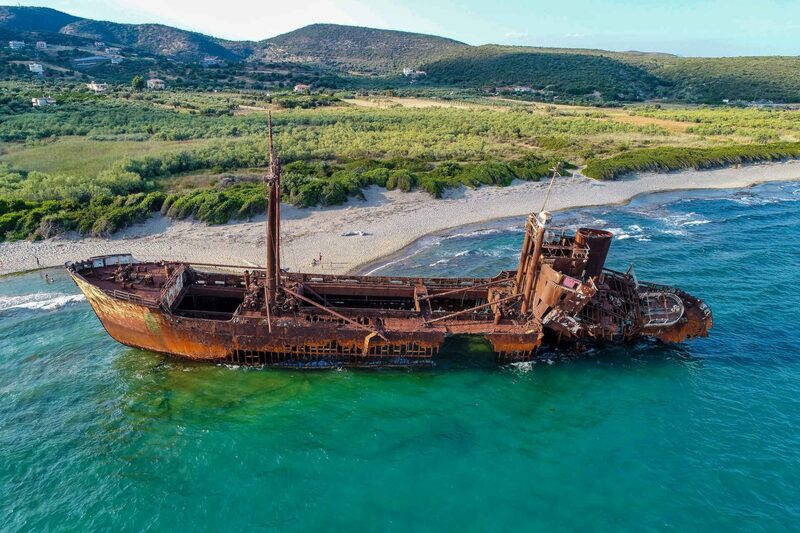 See the rusty Dimitrios shipwreck at Selenitsa beach in the Valtaki area. 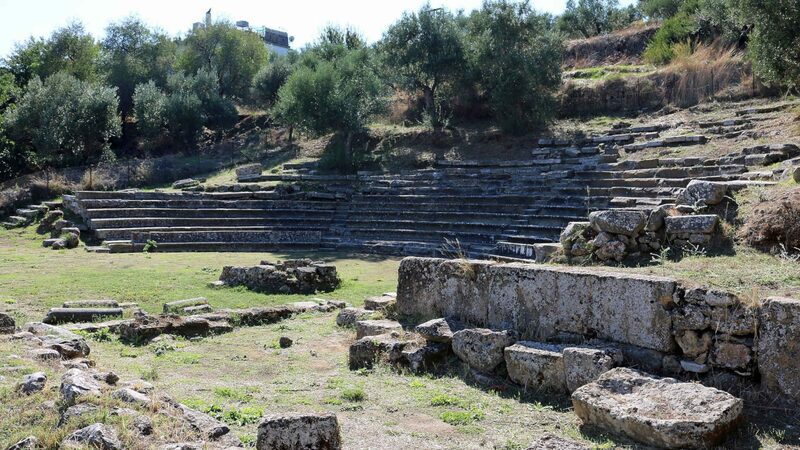 Visit the ruins of the Roman theater in Gythion, at the foot of the ancient acropolis. 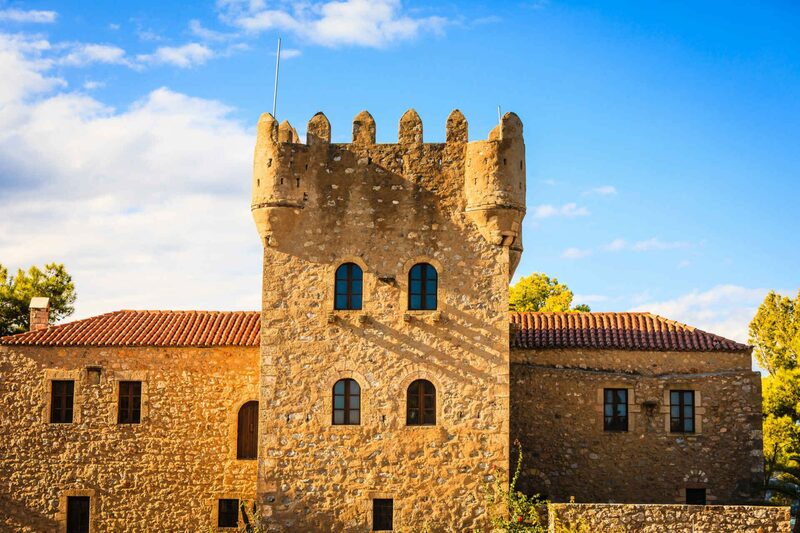 Visit the Passava Castle along the road from Gythion to Areopoli, about 10 km away from Gythion. The Frankish castle was built in 1254, at a strategic location on a hill, so the Franks could keep an eye on the Maniots. The castle is ruined, but the walls are still there. Visit the remains of the Goulades Castle (actually it was more like a tower house), near the village of Mavrovouni. Visit the village of Geraki, a 50 minutes drive to the northeast of Gythion. This is a pretty village with small alleys, traditional mansions, and a central square where you can drink coffee at one of the little cafes. Nearby is a Frankish castle built in 1209, with the little church of Agios Georgios inside. Visit breathtaking Monemvasia, a drive of about 1 hour and 15 minutes. 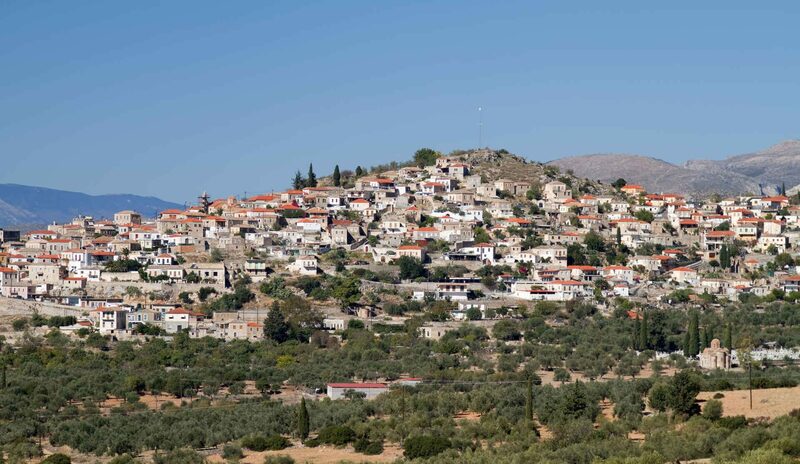 Visit the famous Greek city of Sparta, a 40 minutes drive. Visit the beautiful Mystras, a 50 minutes drive from Gythion. Take the ferry from Gythio to Kithira and Antikithira. Take a boat tour in the most beautiful caves of Greece, the Caves of Diros, a 40 minutes drive from Gythion. ( +30 2733 024474 ), which is located behind the city hall in a small street, or at Ta Filarakia (‘Friends’, +30 2733 023795 ), which is opposite the island of Cranae. From Athens, or from abroad you can fly to Kalamata Airport, rent a car at the airport and take the road to Areopoli, and next to Gythio. 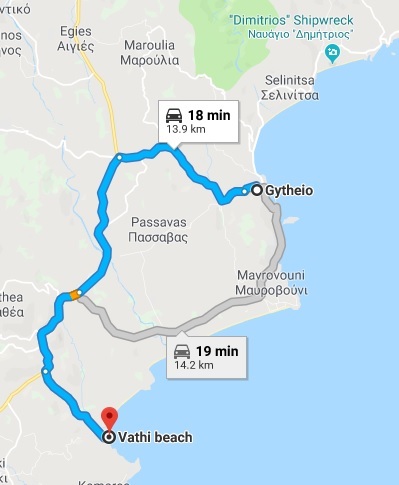 The distance from Kalamata to Gythio is about 110 kilometers. It will take about 2.5 hours. The route has tolls, which have to be paid in cash. An alternative is the road via Taygetos – Sparta. It’s the same distance, but it will take you quiet a bit longer because of the many curves and hairpin turns going up and down the mountains. It’s a route of spectacular beauty, though, but also tiring. 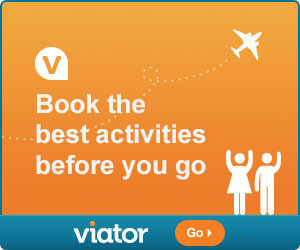 You can rent a car at Athens airport and take the route Athens – Corinth – Tripoli – Sparta – Gythio. It will take about 3 to 4 hours. The road has tolls, which have to be payed in cash. Take bus line X93 express to Athens intercity bus station, which is located on Kiffisiou Avenue. The trip takes about 65 min. This bus route is the only way to reach the intercity bus station besides taxi. It departs every 40 minutes. At Athens Intercity bus station you buy a bus-ticket to Gythio. The bus leaves from platform Laconia. The ride takes about 4 hours. Some of the links on Strolling Greece are affiliate links. If you buy a product or service by clicking on an affiliate link, Strolling Greece will get a small commission at no extra cost for you.